It's amazing, some of the stuff you can find lying about in old notebooks and half-finished stories. I can't recall if I started writing these scraps down before or after I discovered Against the Wicked City: judging by where they are placed and in which notebook it was some time in late 2015 or early 2016, so it's very likely that it had some influence on this. Clay-Folk - Brown of skin, hair dark and curly. Settled upon the canals and aquifers of an ancient irrigation system, now returned to nature. Possibly the descendants of the builders of those ruins. Peaceable and possessing of great storytellers. Traveling Peoples - Of similar countenance to the Clay-Folk and considered as kin. Ride about with their herds upon their chosen beasts: horses, bison, and mammoths. Mountain People - Light brown of tone, prone to greying early. Hold the mountain passes secure and tax merchants heavily. Near all their talk is of yak milk and dragon-gods, and they talk incessantly. River People - Red-gold skin and sandy hair. They hold all things in common upon their rafts, and perform no marriages among themselves. Their women go bare-breasted and the men all train in song. Pale Men - Stocky, pallid, hair black and thin. They came from the far North and sought to introduce civilization to the Clay-Folk. Their homes are built of black metal and cough up black clouds. They are humorless at large, and do not care for gods or stories of gods. Sea Peoples - Swarthy folk who live on the coast to the south, living off their rocky vineyards and on the bounty of the sea. Blade-priests of the swordfish-god come north in pilgrimage. Bloody Men - Their bodies are covered in scab-stripes from flagellation. They hate all other bands of men on the Steppe, for reasons that have been forgotten by the targets of their raids. Their hordes grow and grow without ceasing. Beast Men -They wear the heads of goats and the hides of dogs and have forgone the speech of man entirely. They live by the club and the shattered skull. Men of the Moon - Silver and without hair, taller than a strong men by half. Their voices are like flutes, and they trade in curses. Those Who are Not Men - Seen only ever at a distance in the twilight: a dark form and two eyes like the last embers of the sun. That is all. Enemies of the Pale Men - None know who or what drove them south from their bitter forests. All that can be said is mercantile hearsay and supposition, for the Pale Men say nothing. Those from the World Beyond - There are tales of great empires across the mountains, across the sea, across time and across the far end of the steppe. Will they turn their eyes here, as did the Pale Men? None know yet. Demons of earth, sea, and air - Most prolific of all dangers upon the steppe. Monsters of the Steppe - Solitary beings glimpsed in the far distance. Skinchangers - A man who has worn too many skins loses his own body, until he is just a filthy breath in a coat of hair. Flesh-Folk - Imagine the shape of a man, bloated and without skin, pink and marbled white, tottering mindlessly through the grass in herds. They are the embodiment of man's great failure. Abu the creator breathed life into the Clay-Folk. Repappa the Tricky One taught the Clay-Folk how to make the Flesh-Folk. Zaizu took pity upon the Flesh-Folk. She tried to give them her breath, but failed to give them souls. They remain only the image of man. All manner of evil spirits of the earth came forth when Sha-Bo-Nen made emissions upon the ground to make clay like Abu. All manner of evil spirits of the sky were made in the arguments between Gallu and Tu-La. All manner of evil spirits of the sea were made from the afterbirth of Loe - the curse of Unu-Za fouled the Sea-Mother's womb and killed her some Foteh, whose body become host to Gash the Worm. Jima-Who-Made-the-Moon lost the gift he had forged for his beloved Niben in a game of bones to Shisheh, Shapeless One. Mato sends down stars from the sky, for he loathes the earth of Sha-Bo-Nen and stays loyal to the tyrant Sken. The Thousand Legions of Baru once made the march to heaven and deposed the tyrant Sken. They camp there still and became the stars. Tuzza the Mishapen is hairy and apelike - he gambols about as a clown, but his souls is sad. He is rejected by those he seeks to bring joy to. Red Charzoum is the god of slavers. He is a wrathful and unkind master. The realms under the earth are domain of Musu the Quiet. The wicked he gives to his lover Ahan, whose belly swells with souls and who womb births all manner of deep creatures. Hanech-Ta sought to aid Baru by building a tower to heaven, but was never able to finish. The dead not eaten by Ahan are made slaves of Xa-Ruc-Li for a hundred years and a day in his war against the demons of the earth, sea, and sky. Shi-Dhes drew a map of all the heavens, and of all realms on and beneath the earth. She did this to account for all the treasures in the world. Those who die are taken by Galmuz, who flies in the night. He does not speak, and accepts no gifts. He is pleased only by the rites of sky funeral. Rasch-Lo is the builder of walls and layer of foundations. With his brother Hanech-Ta he makes bricks of clay and walls of stone. The name of Eshu is known to all, but none know why. His name marks all secrets above and below. Xerech the Hundred-Thousand-Legged stalks the world and swallows up rivers and cities in search of his tail. Rosh-Acho wars against the Brothers Behind Walls. He lords over the hunt, and hoards all good cuts of meat. Mashu the sorcerer-king is master of the Darker Arts. 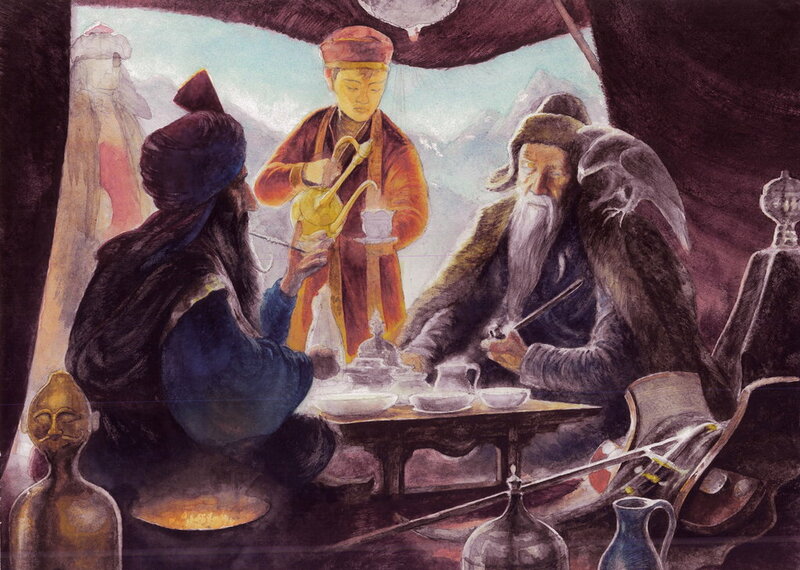 His apprentice Tachu built the Wise Ways to cast light upon his master's villainy. Grim Lerli poles the streams of time in her canoe. With her travels Jambul the Sleeper and the Dreamer, whose lullaby is made by four-armed Sucho-Sha on drum and flute. Together they encompass all seasons and turnings. There was a crusade in the north. It passed by the steppe, but ripples of it were still felt. The cycle of the phases of the moon is a curse that might be delivered on those who go out on fell nights. The goddess behind it has no name, the storytellers are agreed that it is neither Niben nor Shisheh's doing. Storytellers fill the role of bard; astrologers, haruspexes, and augurs fill the role of wizards. Times are changing, borders shifting, enemies now friends. Zodiac signs: eagle, serpent, bear, cat, goat, catfish, prairie dog, bison (yak), raveb, tower-tree, and crab. There's a background listed here for "born in gunpowder". I have no idea what that was supposed to mean. Unfinished stories are great fodder for RPG material, for real. Good summary. That's what I was thinking when I finished reading. It's a good start. You and the Furtive Goblin really need to talk Dan. I think this is wonderful idea.